1. 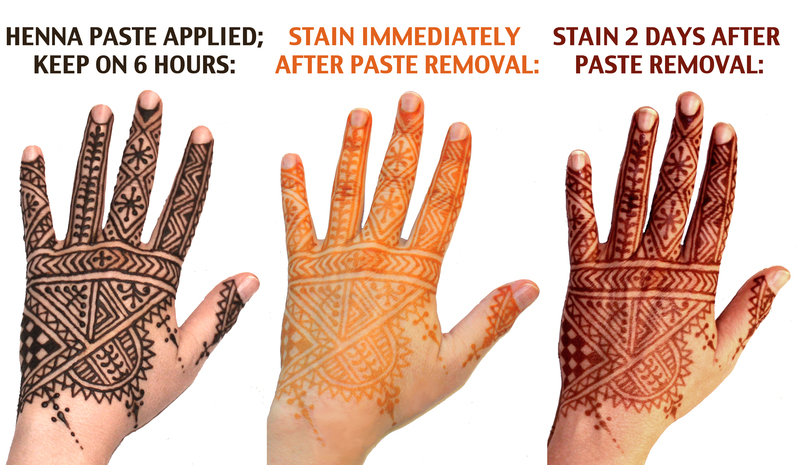 Allow henna paste to dry for 20-30 minutes. 2. Leave henna paste on for 6-12 hours. Then brush, flake or scrape the dried henna paste off. If you have trouble removing the dried paste, you can pour plain lemon or lime juice (not water) onto the paste. Rub it in a little to loosen it back up and wipe it off immediately. You might need to do this a couple of times to get it all off. You should see an orange stain left behind on the skin, which will darken over the next few days. 3. For the next 24 hours after paste removal, avoid getting water on the design if you can. Chemically treated tap water can keep it from getting its darkest. 4. For the next 2-3 days after paste removal, avoid putting any barrier such as lotion or oil on the design while it darkens. The henna stain needs oxygen to darken and any barrier will suffocate it and it will not get very dark. 5. The design will get its darkest around day 3 with a beautiful reddish brown mahogany color. 6. The design will gradually fade away over the next 2 weeks. Is a henna body art safe? The henna plant has been used to adorn bodies since the Bronze Age and is one of the safest substances you can apply to your skin, with an extremely low rate of sensitization. Henna is a natural antiseptic and also acts as a natural sunblock. If you do have a reaction, it is more likely to be a sensitivity to the essential oils in the paste (see list of ingredients below). Henna tattoos are not recommended for children with anemia or G6PD deficiency (Glucose-6-Phosphate Dehydrogenase deficiency which causes anemia). Also, it is advised to be cautious when outdoors with a henna tattoo because the sugar/lemon sealant can attract bees and other insects. JUST SAY NO TO BLACK HENNA! The origin and history of henna usage is hard to pin down. The henna plant, or Lawsonia Inermis, thrives in hot arid regions and is believed to have originated in the Middle East. Basically the art of adorning with henna, also called heena, mehndi, mehendi or mehandi, has been around in some form or another ever since people in that area have been in contact with the plant. There’s evidence of henna usage in Turkey as early as 7000 BC, ornamenting fertility shrine walls. In nearby Syria, there is evidence of henna usage as early as 2100 BC. To the west in Greece, evidence is seen around 1700 BC and to the south in Egypt in 1500 BC. For centuries, Muslim brides in these areas have been partaking in the “Night of Henna” a couple of nights before their weddings. It is not until around 400 AD that we see evidence of henna usage in Indian, in the Ajanta Caves. Some sources claim that it wasn’t until 1200 AD that henna usage spread to India. For the last 200 years or so, mehndi has been a mainstay of traditional Indian bridal ceremonies, with brides getting intricate henna designs on both sides of the arms from the elbow down and on the front of the shins and feet. For the last 10 years or so, henna has become increasingly popular here in the United States. You can also find out more information about henna at Henna Page. New World Henna uses 100% natural ingredients: Henna plant powder, sugar, molasses, lemon juice, cajeput oil (same family as both eucalyptus and tee tree but slightly milder and smells better!) and lavender oil (mild as always).